A late report on my August 14 observations and associated topics. August 14 featured a nice clear evening. 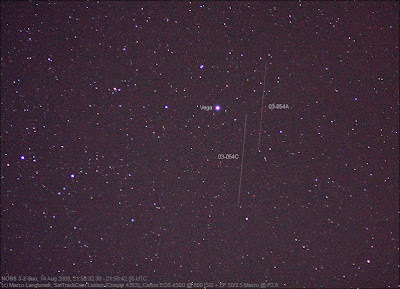 I captured the Keyhole USA 186 (05-042A), the Japanese failed radar sat IGS 1B (03-009B), the NOSS 3-2 duo (03-054A & 03-054C) and a piece of a Russian rocket stage (86-052D) that I caught as a bright stray. NOSS (Naval Ocean Surveillance System) satellites operate in pairs or triples (the older ones), orbiting close together, and locate shipping by tracking radio communications. They belong to the US Navy. Usually they are faint (mag. +5 to +6) but on occasion can appear brighter. USA 186 Keyhole manoeuvred: connected to Georgia events or not? USA 186 (05-042A) appeared somewhat late, but as the elset I had available was 10 days old I did not think anything particular about that. It was Pierre, who observed the same pass from France, who realized the sat had made a manoeuvre. This was confirmed by additional observations the next two nights by Pierre, Ted and Alberto. The manoeuvre entailed adjusting the eccentricity and mean motion, and perhaps a small inclination adjustment. Perigee was brought down slightly, and apogee up, to a 261 x 1024 km orbit (was 264 x 1017 km). 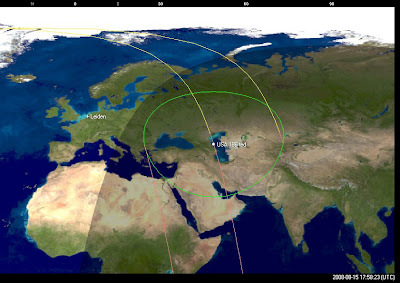 Using a pre-manoeuvre elset by Mike and an adjusted version of Ted's post-manoeuvre elset, I find that the manoeuvre likely happend at Aug 14.6 UTC, some six hours before Pierre and my observation. Satellites usually manoeuvre when the perigee is at the equator, as this minimizes fuell needed and maximizes results that can be obtained. 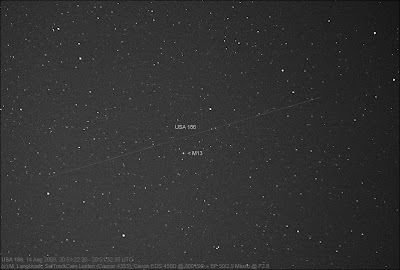 USA 186 did not have it's perigee on the equator on the moment of manoeuvre however. The manoeuvre comes at a time when chaotic war activities between Russia and Georgia are a focus of interest. This opens the question whether this manoeuvre of USA 186 (a Keyhole/improved Crystal satellite with high definition optical imagery capacities) is related. Checking the pre-manoeuvre orbit against the post-manoeuvre orbit concerning passes over the relevant area of interest, it appears that the object was to synchronize passes as much as possible into a sequence where a daylight pass is followed exactly 11 hours later by a nighttime pass: with in addition an as exact as possible repeat of the observing geometry after 4 days. Whether or not this is related to the Georgia events, is a matter of speculation. Ted thinks it is not the case.